Sell to Us Price: $159.90 each. 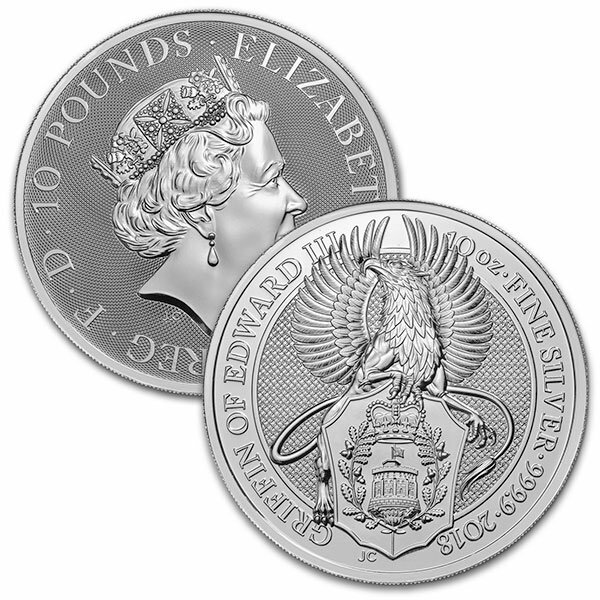 Money Metals Exchange welcomes another addition to the Royal Mint's Queen's Beast series - the 10 oz Griffin. This massive coin with a 2018 date complements the 2 ounce fine silver Griffin coin which is dated 2017. The Griffin is the second in a series planned for 10 designs total. Each silver bullion coin will depict one of The Queen’s Beasts, reimagined by Royal Mint coin designer Jody Clark. Jody also created the most recent definitive coinage portrait of Her Majesty to appear on United Kingdom coins. His bold interpretation of the Lion of England was the first design to be released, and is now followed by the Griffin of King Edward III. These stunning silver bullion coins ship individually sealed in a plastic capsule . A full mint box contains 15 coins uncirculated coins (150 ozs.). These enormous coins are denominated as 10 British pounds - official legal tender in the United Kingdom. Great for those investing in bullion or interested in coin collecting. 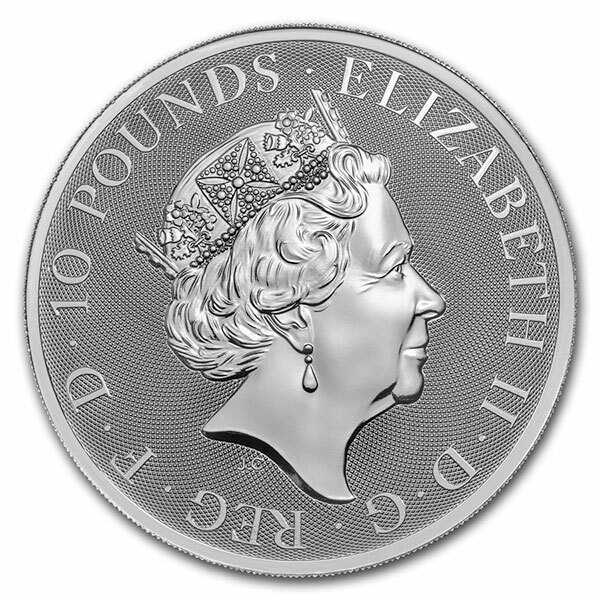 The coin's obverse carries a portrait of Queen Elizabeth II in high relief along with her name and the 10 pound denomination. The reverse features a proud griffin with wings spread clutching England's official heraldic shield. 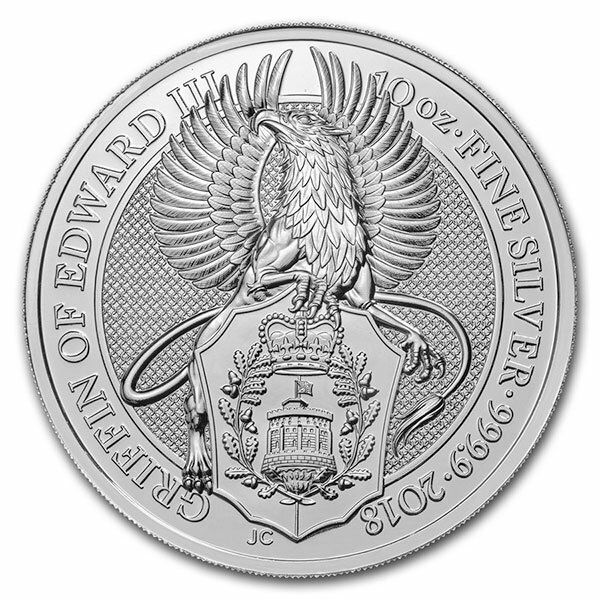 The reverse also identifies the silver British coin as "The Griffin of Edward III" along with displaying the coin’s weight, purity, metal content, and date. Our current buy pricing is $159.90 each and we will buy up to 50 ounces at this price. Simply call us on any weekday to lock pricing at 1-800-800-1865. You can now sell your British Royal Mint Queen's Beast; Griffin - 10 Oz Silver Coin .9999 Pure back to us online, at a price of $159.90 each!